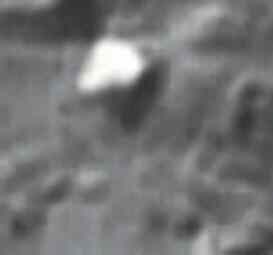 1996: Village on the Moon? Note: you should view these images in the highest resolution possible with imaging software rather than your browser for best results. This mosaic of Clementine UVVIS images covers the center of the impact crater Tycho. It was formed when a large meteorite (or comet) slammed into the Moon. The version on the right is a 3 color composite (415 nm, 750 nm, 1000 nm); the version in the center is a color composite of wavelength ratios which show different rock and soil types. Note the distinct color difference of the central peak due to excavation of deep material during the impact that formed the crater. 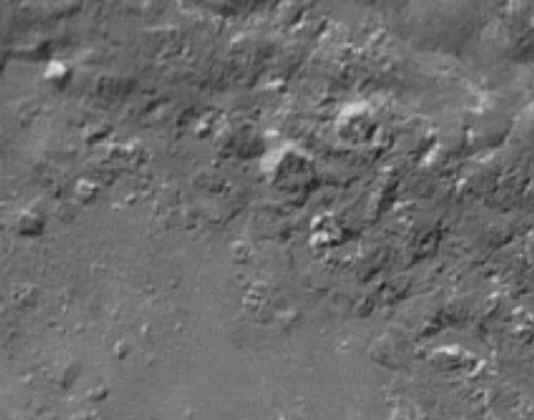 The ratio image on the left enhances an unusual polygonal pattern in the floor of the crater. The origin of this feature is not clear, however future work using all 11 wavelengths collected by the UVVIS and NIR cameras will most likely reveal the origin of these enigmatic “cracks”. These Clementine Images and the accompanying caption were found on the USGS Clementine web site. They show not only the anomalous “polygonal pattern”, but some highly unusual “debris” on the terraced ridge overlooking the crater floor. The right hand 3-color mosaic shows 5 of the brightest objects certainly do not resemble “standard” Lunar debris. 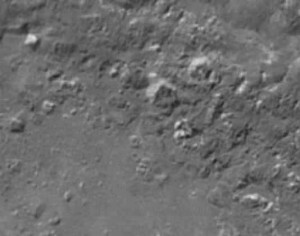 The first image above shows Tycho crater (43S, 12W) from the UV/Vis camera with the 1000 nm filter. The image was taken on Orbit 40 on 28 Feb 1994,13:17:00 UT at an altitude of 425 Km. North is upward in this image. 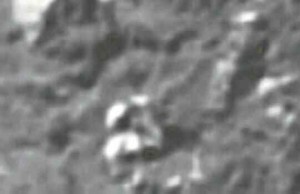 This “regular” (visible light) Clementine image was taken from the NSSDC Clementine section on their web page and tends to hide the “polygonal pattern” but shows the “Lunar Village” in sharp relief. 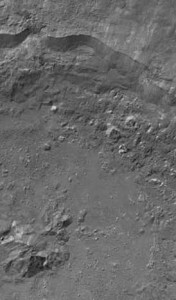 The polygonal pattern may be indicative of a “substructure” beneath the crater floor. It has been implied that the Moon itself may be either constructed or at least partially modified. There is actually some reason to consider this idea. It has been noted that all craters on the Moon seem to have about the same depth, irrespective of the size (and mass) of the impacting object. Also, the Moon seems to be “light”. It does not have the proper density for its apparent make-up. (I will dig up sources on these observations when time permits). Tycho does seem to be insufficiently deep given its width. The “polygonal pattern” resembles a skin stretched over a gridwork.  As for the debris, a close up of some of the objects shows just how unusual they are. their unusual geometric shapes, and their proximity to each other. it appears to form fit on the left hand side matching the terraced terrain. “chimney” meets the “roof”. The “chimney” also has a domed tip with a flange. The accompanying object, “Chalet 2” also displays comparable peculiar characteristics.  larger sub surface object or was actually “dug in” to the side of the hill. in both the color composite mosaic shown in the USGS images. This object resembles a tractor or bulldozer with a drooping scoop set off to the right. It seems to have an opening in-between the “arm” and the base of the main body. the background imply it is not made of the same material. for this object forming naturally. Moon that I am aware of. For the moment, they must stand as truly anomalous and potentially artificial. 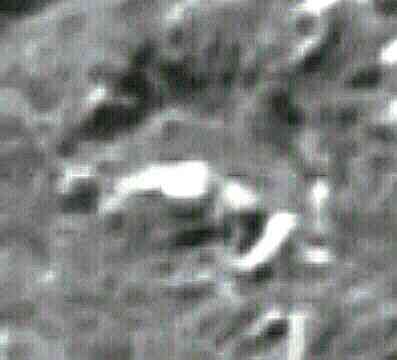 Posted in MoonTagged Moon, Astronomy, Tycho, Impact crater, Backhoe, Far side of the MooncommentLeave a Comment on 1996: Village on the Moon?